Cell surface trafficking and endocytosis of neurotransmitter receptors are important regulatory mechanisms of neurotransmission. Biotinylation of plasma membrane proteins in brain slices allows their separation from those present in intracellular organelles. Membrane-impermeable, thiol-cleavable and amine-reactive biotinylation reagents (e.g. EZ-link sulfo-NHS-SS-biotin) form a stable covalent linkage with primary amino groups of surface-exposed proteins. Following homogenisation of brain slices and solubilisation of membranes, biotin-labelled proteins can be isolated with avidin or streptavidin linked to agarose beads. Bound biotinylated proteins are released from avidin or streptavidin in the presence of reducing agents (e.g. glutathione or β-mercaptoethanol). Quantitative differences in the molecular composition of biotin-labelled (surface) and unlabelled (intracellular) protein fractions can be analysed using immunoblotting with target protein-specific antibodies. 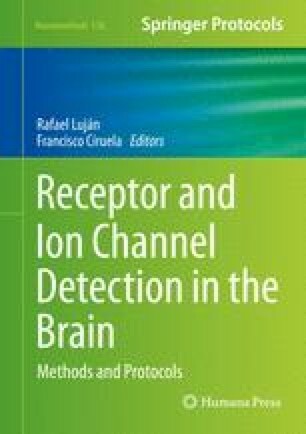 While many variations of this procedure exist in the literature, in this chapter we describe the biotinylation protocol that we have applied for the investigation of quantitative changes in the cell surface expression and internalisation of ionotropic glutamate receptors in acute brain slices. I would like to thank Dr Clare M. Galdding for adapting the cell surface biotinylation technique for the investigation of tyrosine dephosphorylation of AMPA receptors in mGluR-LTD and NMDAR-LTD using hippocampal slices (Gladding et al., 2009). This research was supported by Grant from the Biotechnology and Biological Sciences Research Council, UK (Grant BB/J015938/1).